I have been guilty of underfeeding my potted plants. It started with going organic in my outdoor garden. Eventually I started letting everything take care of itself. 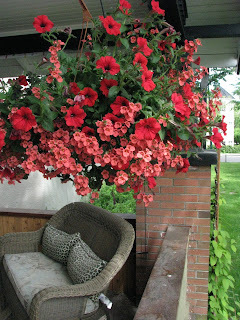 Trouble is, potted plants and hanging baskets don’t have much of a chance if they are not fertilized and watered. They are living in a holding material we call soil but it is really just mixed materials and none of them provide any nutrients. Top that off with the fact most annuals are highly bred flowers. Like the horses of Cavalia, they need grooming and feeding, not just pasturing until performance day. *** For more info: Listen to my column on CBC's Alberta@noon this Thursday (June 30) or check out the expanded version of this column in the Calgary Herald's Gardening section July 8th where I give you all the tips you need to keep your flower pots & basets great all summer.